In these times of selfies and self proclaimed professional photographers, finding an exciting, creative experience in front of the lens may seem improbable. You've probably looked at several lackluster portfolios as you search for a photographer worthy of capturing your special moment with a unique vision and a vivid imagination. While browsing my work it may be hard to take in that my images are created in complete darkness, that all of the fantastic effects in these portraits were inspired by the exchange between myself and the client, and that each electrifying streak of light was made by my movements painting with light , captured by long exposure photography, not manipulated via photoshop. When you try light painting for yourself you will be immersed in the most extraordinary photographic magic trick, one that results in a truly amazing experience for you to cherish and an innovative portrait capturing the light and essence that only you can radiate. Contact me today to talk about your special milestone, and let's make magic together. Creativity is how I honor my truth, expanding in different mediums to become my fullest self. I’ve experimented with drawing, painting, poetry and performance, but light painting photography has captivated my imagination like no other medium. In light painting there are no limits to my expression. I use the night as my canvas and light as my paintbrushes, producing surreal effects in the moment of creation, without the need of computer imaging. The act of creating in darkness itself is my greatest pleasure. Working intimately with a subject, darting about in absolute darkness, painting layers of light onto and around them, my heart racing, sweat dripping; I am deep in ritual. Inventing unimagined textures of light, drawing inspiration from the subject’s unique essence, fully present in this singular moment we share; this is my happy place. The thrill of creation puts me in a spiritual trance. I often marvel at the magical results knowing that the movements that lead me to the image came from a greater power outside of me. I am a conduit for creative energy, crafting spiritual light works in darkness. My finished works reflect the result of connecting deeply with the beauty of the human soul, translating the mystical essence of the subject into glowing portraits. Light painting is the medium I use to connect with my tradition while away from my homeland and spiritual family. 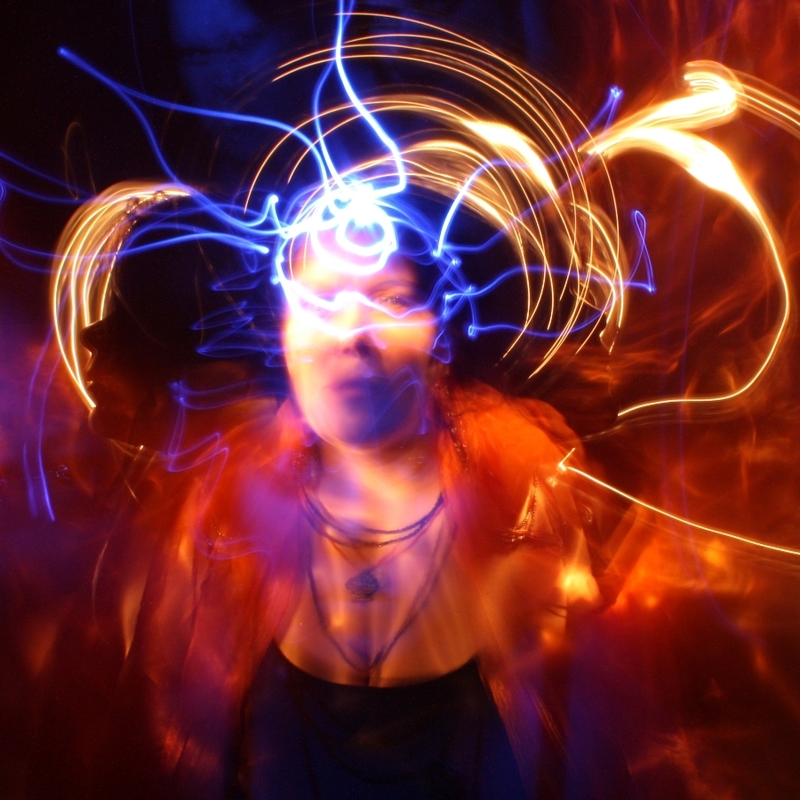 The energy and electricity channeled during my light painting performances are tools I use to cleanse negativity, heal spirit, inspire magic, create beauty and bring joy. "Artist at Work (Self Portrait)"
2016 Atlanta’s Fulton County Arts and Culture fund “Vicarious Engagement”, performance art by Jessica Scott-Felder. Commissioned collaborating artist as part of Jessica Scott-Felder’s public arts commissioned performance “Vicarious Engagement” at the Swan Coach House Gallery during debut of “Print or Projection”, curated by Karen Tauches. January 14th, 2016. 2014 Atlanta’s Fulton County Arts and Culture commissioned a total of three large ( 5’x8’) gliclee prints on canvas for their Public Arts collection during the 2014 exhibit ‘ Transcend’. Collected works include “ Voo da Menina Mulher (Transcende)- Flight of the Girl-Woman”, “Vento levou(Boa Viagem)- The wind took it (Safe Travels)”, “Samba do Exu (Carnaval)- Exu’s Samba (Carnaval)”. 2012 Atlanta Office of Cultural Affairs and Elevate ATL present Banho de Luz: a Light Bath Ritual. Commissioned public works collaborative performance with artist Lillian Blades and filmmaker Roni Nicole Henderson which included live light painting photography performance (Cheranichit), projections of finished live works (Cheranichit), projections of live filming (Henderson), glowing tapestries and sculptures (Blades). 2015 Divine Feminine presented by the Auburn Avenue Research Library at the Hammonds House Museum. Curated by Linda Edmonds-Lima. September through December. and Culture and Digital Arts Studio. Curated by center director Robin Ligon-Williams. 10/2014- 02/2015. 2009 Liza Garza Presents ‘Canciones de mi Madre (My Mama’s Songs)’, Composition Gallery, Atlanta, GA. Studio Clout Presents: Linda Costa - Collected Works. Studio Clout, Atlanta, GA. September through December. 2008 Urban Tea Party Presents: Linda Costa, Urban Tea Party, Atlanta, GA.
2012 Brasil- Diaspora Dialogue, New Orleans Jazz & Heritage Foundation, New Orleans, LA. Washington, D.C. and Houston, Texas. FORM artistic independence book release, Mint Gallery, Atlanta, GA.
SOPO Art Bike Show, the Goat Farm, Atlanta, GA. Collaged art bike. Burnaway Second Annual Fundraiser, Krog Street Warehouse, Atlanta, GA. Limited edition prints. 2010 Bang! Arts Presents: The Egg Came First, 7Stages Theater Gallery, Atlanta, GA.
2009 ViewMaster Installment, The Soundbar, Chicago, IL. See Through Souls, Picaflor Gallery, Atlanta, GA.
2016 Print or Projection, Swan Coach House Gallery, Atlanta, GA. Commissioned performance art. 2015 Divine Feminine: Homage to Oxum Hammonds House Museum, Atlanta, GA. October, 24th. Choreography, performance art, musical composition, singing, live light painting performance. Original musical composition created in collaboration with artist (husband) Tim Cheranichit; song debuted via recording during performance art piece performed by live model and collaborator Adinah Morgan who personified the Yoruba river Goddess, Oxum. 2010 Live Art with David Mack and Bill Sienkiewicz, DooGallery, Atlanta, GA. Group exhibition, live photography performance alongside Marvel Comic Book Artists and others. 2016 Razzano, Tiffany: “Studios at 5663 to celebrate grand opening.” Pinellas Park Beacon, April 2016. Mention. 2012 Pousner, Howard: “Elevate Series Returns to Downtown,” The Atlanta Journal Constitution, Sunday, October 7th, 2012. Photography. 2012-15 Page, Jason D. : Various articles. LightPaintingPhotography.Com, October 2012 - September 2015. Photography. 2011 Rodriguez, Alberto Brown: “Artista de Mundo- Linda Costa,” Mundo Hispanico. January, 2011. Photography and interview. 2015 Cheranichit, Linda Costa: Transcend: Light Paintings by Linda Costa Cheranichit, self published. 20 pages, full color. Collected photographs from the Transcend exhibition. 2013 Davis, Theresa: After This We Go Dark, Sibling Rivalry Press. Book cover photography. Semali, Yamin: Yamin. Yen Dollar Music. Album cover photography. 2011 Williams England Design (compiler), Form: Artistic Independence 2011, Williams England Design. Photography. Maparyan, Layli: The Womanist Idea: Contemporary Sociological Perspectives; Routledge, USA. Book cover. Carter, Angela: Angela Carter Presents: Atlanta’s Finest, Sumona Productions. Featured Artist. 2010 Poulton, Mark: “David Mack Interview,” Arcana Magazine, Volume 1, Issue 1; Arcana Comics, Australia. Back cover photography. Mack, David: “Dream Logic Issues: #1, #2” Marvel's Icon Comics, May- August 2010. Photography. Rising Appalachia, The Sails of Self, self released, 2010. Album Cover Photography. 2009 Cyr, Linda: Art Revolution: Alternative Approaches for Fine Artists and Illustrators, North Light Books. Photography. 2008 Williams England Design (compiler), Form: Artistic Independence 2008, Williams England Design. Photography. Mack, David: Kabuki: The Alchemy, Marvel Publishing Inc., 2008. Photography. Devoe, Chris: The Perception of Obstacles, Arepaz Records. Album Cover Photography. 2007-10Mack, David: “Reflections Issues: #9, #10, #11, #12” Marvel's Icon Comics, 2007-2010. Photography. 2016 Accepted as resident artist at The Studios at 5663 in Pinellas Park, FL. 2015 Guided Light Painting Photography Workshop for Sistagraphy members. 2014 Became member of Fulton County Arts and Culture Artist Registry. 2012 Guided Light Painting Photography Workshop for Click Atlanta members. 2010 Brussels: Tarot An Artists' Vision of the Future, Petit Papiers, Brussels, Belgium. Marvel Comics artist David Mack ‘sampled’ my light painted portraits of him for the images “The Magician” and “King of Wands”.